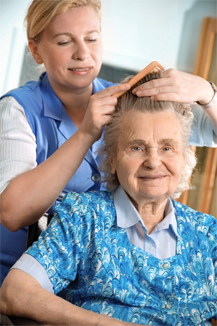 Our goal is to enhance the lives of seniors and their families with quality home care services. We tailor our home-in-care services including personal care, companionship for seniors, home helpers and Alzheimer’s care to best fit your loved one’s needs. Caring for seniors requires a special person with just the right touch. Our highest priority is your peace of mind about the quality of care your loved one is receiving; this is only accomplished by hiring outstanding caregivers. Also, we require our caregivers to perform ongoing training to keep them up-to-date and the best in the business. With over 30-years of in-home care experience, our well-trained caregivers are ready to ensure your continuous comfort, safety and security at home. We work closely with you to design and deliver customized care plan flexibly suited to address your individual needs. We put you and your family first, providing as much or as little help as needed to maintain your loved one’s dignity and independence. We are a professional home care agency dedicated to providing comprehensive in-home care services, senior and elder care services, Alzheimer’s & dementia care, as well as home health care services to Chicago area residents, including Cook County and Lake County in Illinois. We are available 24 hours a day, 7 days per week and can provide dependable home health care services tailored to meet your individual needs. When you’re not feeling your best, tasks that used to be easy like taking a bath, making a healthy meal, or doing laundry become more difficult. Struggling with these activities of daily living can be stressful and increase the risk of accidents. At Homewatch CareGivers Northshore we specialize in providing you with the Best Home Care Professionals in Morton Grove Illinois. We recognize the importance of trust and empathy. That is why each and every senior caregiver undergoes extensive interviews and background checks. Caregivers are bonded, insured and meet all State of Illinois requirements for certification and licensure. Because you need someone to take care of an aging parent or loved one, it all starts with trust and confidence in people. Our compassionate and certified dementia care team serving Morton Grove understands that caring for a family member with memory impairment is stressful, and having a neutral caregiver from outside your family can help ease the emotional burden that comes with caring for a loved one. The first step to finding the Best Morton Grove IL Home Care agency is to determine the level of care that is needed. To learn more about the comprehensive in-home care services, senior and elder care services, Alzheimer’s & dementia care, as well as home health care services we provide to Morton Grove IL area residents and to see what level of care you or your loved one may need please contact us at (847) 616-5600 or CLICK HERE to schedule a FREE – NO OBLIGATION HOME CARE ASSESSMENT.